When cutting your squares, use your Bias Square Plus Ruler for precision cutting! This is the first time I've used this ruler and I really like it. I like the fact that the 1/8" lines are dotted - so you can easily see those and differentiate quickly between the 1/4" marks and the 1/8" marks. The ruler also makes it quite easy to cut half-square triangles and quarter-square triangles. Almost all of the blocks will require one or both kinds of triangles. So this ruler will be super helpful as we go along. I am a very visual person, so when it comes time to put a block together - I have to layout the entire thing before I start sewing pieces together. 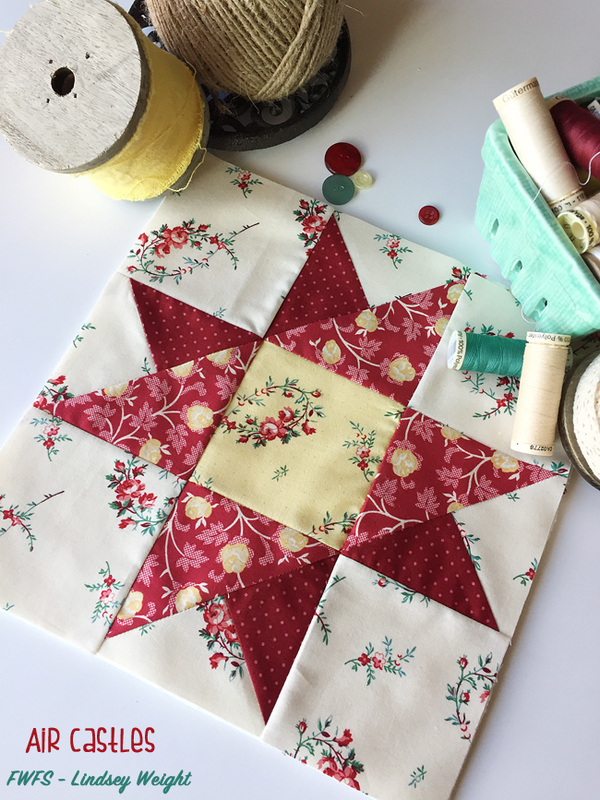 What I like to do is lay it out right next to my sewing machine - so I can easily pick up the pieces and sew them together without accidentally sewing the wrong pieces together. I love how the block turned out! Can I purchase the finishing kit at a later time? I decided to order the finishing kit now because I didn't want them to run out when I was ready for it. I just got the first part yesterday. I have been saving the patterns I want to make this with a stack of fabrics I got for Christmas. Can you provide the patterns in pdf form so I can print them? Just saw block 1. How do I get the rest of the block patterns?? Hi, is it possible to get any more fabric kits? I love your website, your design and products.